Cam rollers are also known as cam followers or track followers and are a specialised form of roller or needle bearings which is designed to follow tracks or cams in a linear motion system. Often used on conveyor belts and process transfer lines, cam rollers allow the smooth and even distribution of loads. There are a couple of main types of cam followers available which are stud type and yoke type. The difference between these is that yoke type cam rollers are generally best suited in applications where minimal deflection is required. While it is true that all cam followers can be track followers, all track followers are not necessarily cam followers. Generally if a track follower has a special shaped outer diameter to follow specific tracks then it can’t be classed as a cam follower. Examples of these include V-grooves or flanges to follow a certain style of track. Cam rollers are measured differently from ball and roller bearings with the bearing size referring to the outside diameter as opposed to the bore diameter. 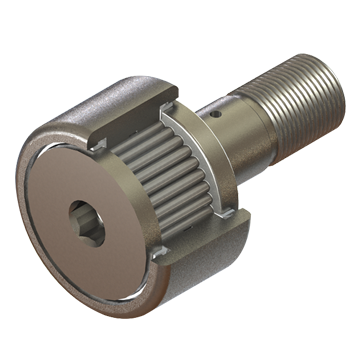 Stud type cam followers normally have a standard sized stud but they are also available with a heavy duty stud which means they are able to handle increased static loads. Yoke cam followers can handle similar loads as heavy duty studs but are unable to handle applications that require deflection. Whatever your application and industry, at Hunt Bearings we will be happy to help you find the right bearings for your needs. For a free no obligation quote just get in touch with our expert team today on 01256 761067 and we’ll be happy to help.